1Hall defended the championship with either Nash or Young under the Freebird Rule. 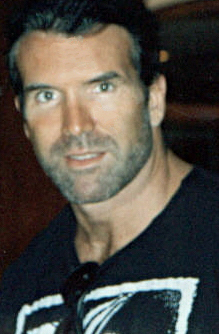 ↑ 1.0 1.1 1.2 1.3 1.4 1.5 1.6 1.7 1.8 "Scott Hall Profile". Online World of Wrestling. สืบค้นเมื่อ 2008-06-18. ↑ Steve Austin Show podcast, "SAS-EP#32 – Razor Ramon" (21:50). Podcastone.com. Retrieved on 2013-11-29. ↑ 3.0 3.1 3.2 "TNA Wrestling profile". Total Nonstop Action Wrestling. สืบค้นเมื่อ 2010-05-06. ↑ "Scott Hall's Early Career". Accelerator's Wrestling Rollercoaster. สืบค้นเมื่อ 2008-06-18. ↑ Scott Hall's profile at. Wrestlingdata.com. Retrieved on 2013-11-29. ↑ "AWA World Tag Team Title history". Wrestling-titles.com. สืบค้นเมื่อ 2009-03-05. ↑ "Pro Wrestling Illustrated Award Winners Match of the Year". Wrestling Information Archive. สืบค้นเมื่อ 2008-06-23. ↑ "Pro Wrestling Illustrated Award Winners Most Improved Wrestler of the Year". Wrestling Information Archive. สืบค้นเมื่อ 2008-06-23. ↑ "Pro Wrestling Illustrated Award Winners Tag Team of the Year". Wrestling Information Archive. สืบค้นเมื่อ 2008-06-23. ↑ "Pro Wrestling Illustrated Top 500 – 1994". Wrestling Information Archive. สืบค้นเมื่อ 2008-07-01. ↑ "Pro Wrestling Illustrated's Top 500 Wrestlers of the PWI Years". Wrestling Information Archive. Archived from the original on 2009-02-27. สืบค้นเมื่อ 2009-03-14. ↑ "Pro Wrestling Illustrated's Top 100 Tag Teams of the PWI Years". Wrestling Information Archive. สืบค้นเมื่อ 2008-06-23. ↑ Solie's Title Histories: TNA TOTAL NON-STOP ACTION. Solie.org. Retrieved on 2013-11-29. ↑ Unified World Heavyweight Title (USWA). Wrestling-titles.com. Retrieved on 2013-11-29. ↑ 19990221 – Scott Hall. WWE.com. Retrieved on 2013-11-29. ↑ 19991108 – Scott Hall. WWE.com. Retrieved on 2013-11-29. ↑ NWA/WCW World Television Title. Wrestling-titles.com. Retrieved on 2013-11-29. ↑ "World War 3 1997 results". Wrestling Supercards and Tournaments. สืบค้นเมื่อ 2008-06-18. ↑ Caribbean Heavyweight Title. Wrestling-titles.com. Retrieved on 2013-11-29. ↑ "WWC Universal Heavyweight Title history". Wrestling-titles.com. สืบค้นเมื่อ 2009-03-05. ↑ Intercontinental Championship – Razor Ramon September 27, 1993 – April 13, 1994. WWE.com. Retrieved on 2013-11-29. ↑ Intercontinental Championship – Razor Ramon August 29, 1994 – January 22, 1995. WWE.com. Retrieved on 2013-11-29. ↑ Intercontinental Championship – Razor Ramon May 19, 1995 – May 22, 1995. WWE.com. Retrieved on 2013-11-29. ↑ Intercontinental Championship – Razor Ramon October 22, 1995 – January 21, 1996. WWE.com. Retrieved on 2013-11-29. หน้านี้แก้ไขล่าสุดเมื่อวันที่ 7 ธันวาคม 2559 เวลา 22:46 น.